Last week we holidayed in beautiful Devon. 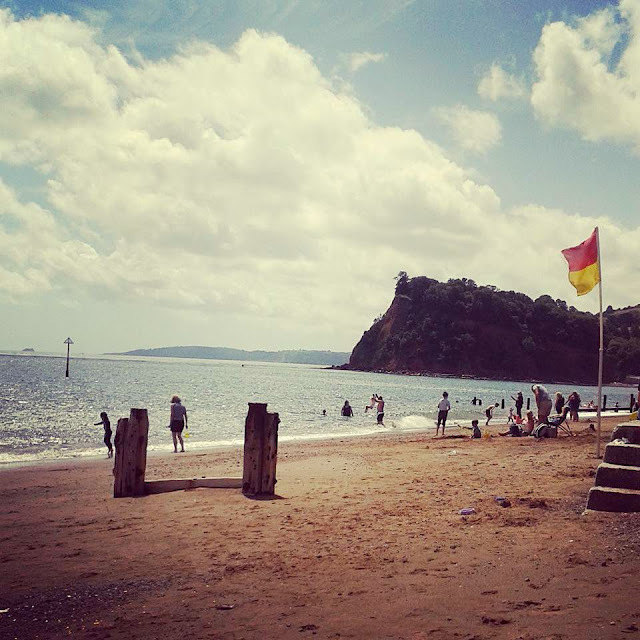 We stayed at the Finlake holiday park in Chudleigh near Newton Abbot, which lies between Dartmoor and the stunning coastline and is the ideal base for touring north Devon. I chose Finlake primarily because I was taking three teenagers with me (my own two, and the Teenager's boyfriend) so it was vital there would be plenty of activities to keep them busy. It had also been recommended to me by Kate who had stayed there previously and thought the facilities would be ideal for us. 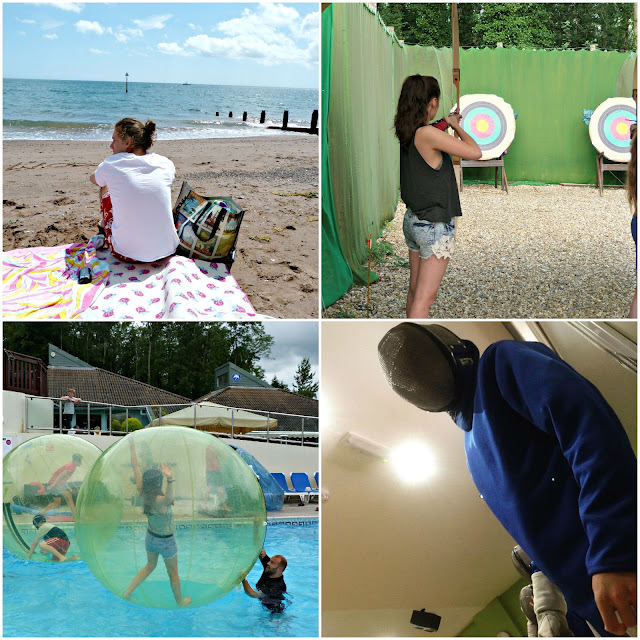 As it turned out, it was a good choice and the teenagers took full advantage of the two pools - indoor and outdoor with a huge water slide - as well as archery, water-walking, and fencing lessons. There were plenty of other things to keep them busy, such as a tennis court, outdoor table-tennis tables, golf, horse riding and numerous other activities. There was a charge for most of them (although the pools, gym, and table tennis and quite a few others were free) but they all seemed good value for money and were all well organised and supervised by the very friendly staff. There was also a health and beauty salon where Tall Daughter treated herself to a manicure, and I had a wonderful (and long overdue) back and shoulder massage. Bliss! Our accommodation was one of their 'VIP' timber holiday homes, which is basically a static caravan clad in timber. If that sounds sniffy it's not meant to be because it was well designed and kitted out with everything you might need, plus I paid extra for an outdoor hot-tub which I think we got our money's worth out of.. The living space in particular was very comfortable although the bedrooms were a bit of a tight squeeze, especially with three teens sharing two rooms. One small quibble was that although towels were included in the price, when we arrived we found 4 bath towels and only two hand towels, which I thought was a bit of a stretch for four people, but a quick phone call to reception resulted in one of the housekeeping team bringing over extra hand towels pretty much straightaway. So, the teenagers thoroughly enjoyed their holiday, and so did I, but I wasn't expecting to fall completely and totally in love with Devon. Oh my goodness, what a beautiful part of the country - the views of the beautiful rugged coastline and rolling hills are truly breathtaking, and I loved the villages and market towns we visited and passed through. During our week there we decided to visit a different place each day, and although we visited some pleasant beaches (Teignmouth, Preston Sands, Paignton) we didn't find one to equal our favourite Welsh beach, Porth Oer, but considering we only saw a small part of the county and there are dozens of beaches in Devon I'm sure there is one somewhere, we just didn't find it. I'm embarrassed to admit that it was my first ever visit to the Devon (but not my last) which means I have a lot of catching up to do. We will definitely be returning, definitely, and in the meantime I'm dreaming of living there permanently. One day, perhaps. 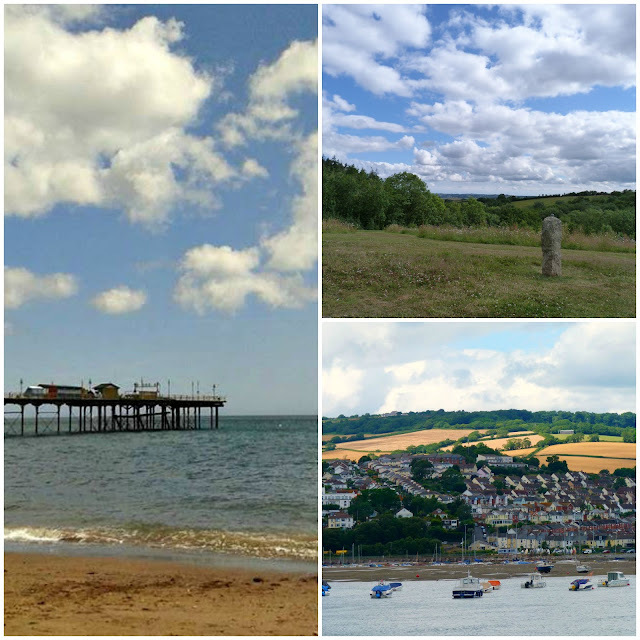 Have you holidayed in Devon? Do you have a favourite beach?